My titles are often abstract concepts that come to me when a painting is nearing completion or finished. Sometimes I realise that I have been working with the concept —often unconsciously —while painting it. This happened with my painting Good Fences Make Good Neighbours, an aerial landscape painting which I completely reworked this year, one fraught with the political complexities of Brexit. So it was this backdrop that I ripped into what I considered to have been an okay painting that wasn’t really hitting the spot. With time, I could see It needed a major overhaul, and I was ready to rip into it, freely and without attachment to outcome. You may perhaps notice the influence of the aerial landscapes of Richard Diebenkorn, which I absorbed while living in California, but perhaps also the wilderness and open skies of West Cornwall, where I live now. As I attempted to unify an unresolved landscape painting, I began shaping new areas of colour and stumbled over new lines of discovery. Borders and boundaries between fields, reservoirs, forgotten spaces and ancient stone structures seemed to come to life. All marking territory and land that humans have claimed over time. Something there is that doesn’t love a wall. The line from Robert Frost’s poem Mending Wall sprang back to mind - several decades after its first reading at school. Borders and frontiers are top of mind: walls that are intended to keep us separate, safe, segregated. Walls between Israelis and Palestinians, Americans and Mexicans, and soon, it would seem, Britons from Europeans. Good fences make good neighbours. Is it really so? I’m excited to announce that this painting has been accepted for EX LIBRIS presented by Newlyn Society of Artists at Tremenheere in Cornwall. 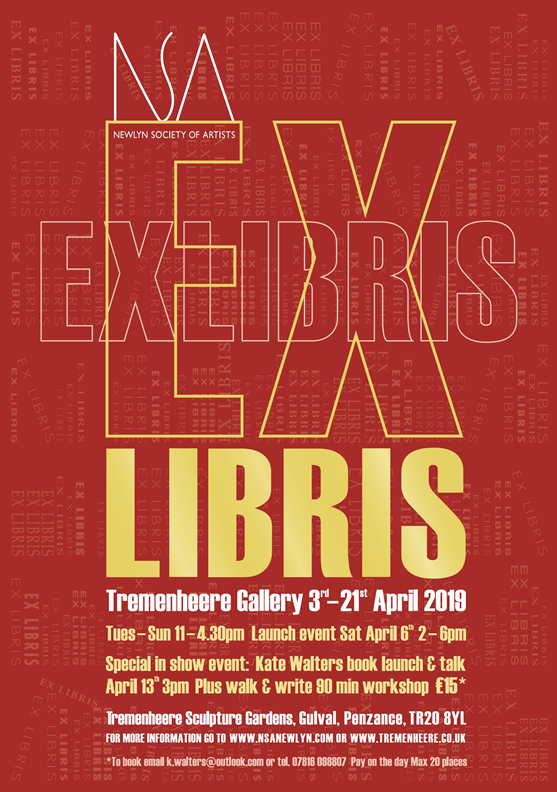 The exhibition focuses on a personal and contemporary view of the relationship between the written word and image and is curated by Dr Ryaa Bread who is curatorial director of Kestle Barton nr Falmouth, Cornwall. The literary theme will be reflected within the curation with a 'bookish' environment at the gallery with display cabinets and bookshelves with the books and texts that relates to the artwork displayed. All artworks are by members of the Newlyn Society of Artists, and runs from 3rd - 22nd April at Tremenheere Sculpture Gardens near Penzance, Cornwall. The Private View is from 2-6pm on Saturday 6th April. I hope to see you there.